Apple took out a massive ad in Las Vegas to highlight the privacy benefits of the iPhone. 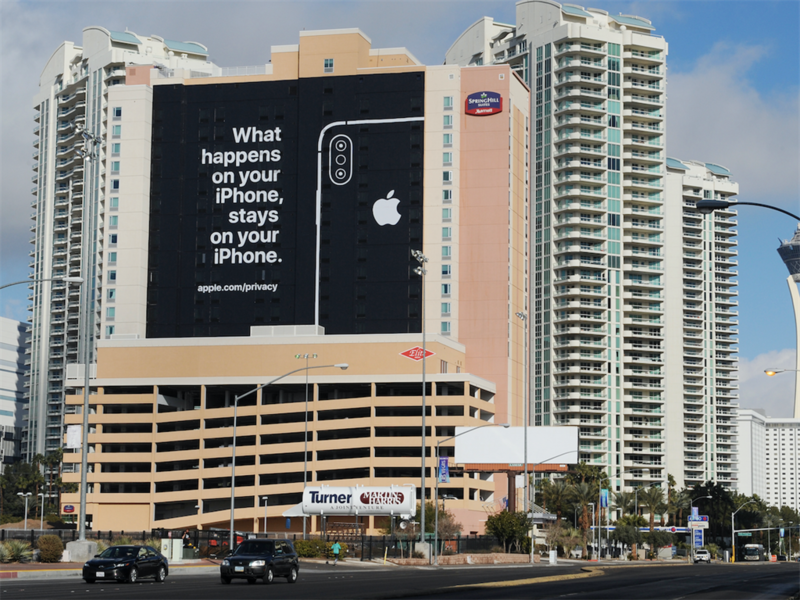 Apple made its presence felt at CES 2019 with a massive billboard highlighting the iPhone’s privacy features. Apple doesn’t attend CES, the world’s biggest tech trade show, as an exhibitor but many of its Android rivals do. The company sees privacy as a major differentiator from its competitor. The ad happened to appear next to a monorail emblazoned with Google ads. Apple doesn’t officially attend the massive Las Vegas tech show CES, but it’s still making its presence felt at the 2019 edition. 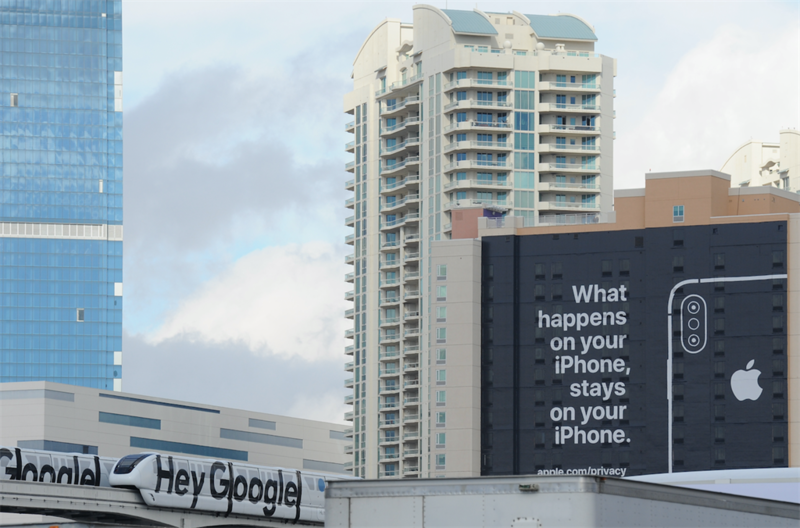 The show kicks off on Tuesday, and Apple has taken out a giant outdoor ad on the side of a Marriott hotel in Las Vegas showing the outline of an iPhone and the slogan: “What happens on your iPhone stays on your iPhone.” At the bottom of the poster is a URL pointing to Apple’s privacy policies. This is Apple flipping the bird at its Android rivals, since the ad plays on fears that the Google-operated mobile system leaks people’s data, be that to governments or hackers. Apple, on the other hand, has emphasised its role as the phone maker that respects its customers’ privacy. Apple fought the FBI when the agency asked Apple to unlock the San Bernardino shooter’s iPhone, for example. And when Facebook was in the spotlight for the Cambridge Analytica data scandal last year, Apple CEO Tim Cook reportedly angered Mark Zuckerberg by weighing in. “We’re not going to traffic in your personal life,” Cook said in June. “Privacy to us is a human right. It’s a civil liberty.” Cook has also called for digital privacy laws in the US. The ad happens to be positioned next to Las Vegas’ monorail system, whose shuttles are currently emblazoned with ads for Google. Here’s a photo showing an ad for Google’s virtual assistant, with the trigger words “Hey Google”, right next to the Apple ad. Apple’s ad juxtaposed against monorail ads for Google. There is a perhaps further unintended irony in that Marriott was affected by a major data breach. The hotel chain announced in January that it had been affected by a major hack, and said on Friday that hackers got hold of 5.25 million passport numbers. Apple doesn’t attend CES as an exhibitor, meaning it doesn’t make any announcements at the show and it doesn’t appear on the trade show floor. Its employees do show up to observe the competition. This wouldn’t be the first time the company has mocked its competitors. An ad targeted at Android users from April 2018 showed the App Store as much safer than rival stores like Google Play, thanks to Apple’s strict vetting processes. You can read our roundup of everything we’re expecting at CES 2019 here.